BERLIN - When the Berlin Legion baseball team entered the summer it wasn’t sure what to exactly expect. It believed it had the talent, just not of a lot of experience to go with it. A little under two months later, it’s easy to say Berlin exceeded expectations. The team finished with a 16-5 record, reached the Pod C final in the Legion state tournament and tied for the fifth-best winning percentage in the state. Berlin’s talented youth was on full display in Tuesday’s elimination game win against Moosup, the team’s biggest game of the season up until that point with sophomore Camden Murphy leading the way. Getting the start on the mound, Murphy gave up six hits in a complete game, helping Berlin stay alive with a 3-2 win. After the game, Van Etten said the performance was a perfect representation of why Murphy has the ability to develop into what he believes can be one of the best arms in the state. 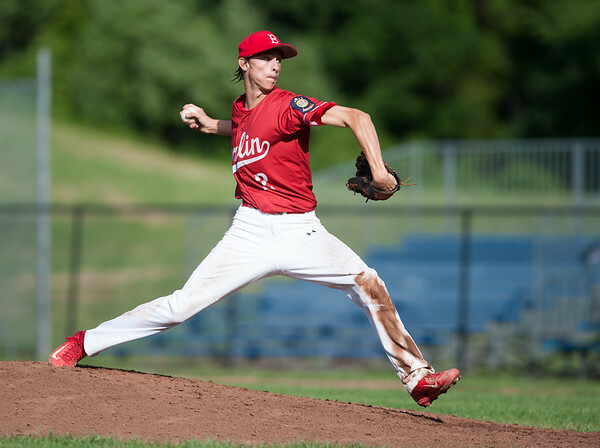 Murphy appreciates Van Etten’s confidence in him and sees playing Legion baseball as a greater chance to get on the mound and develop his pitches. Van Etten said that he saw the potential in Murphy throughout the high school season as he continued to rise while other pitchers struggled and battled injuries. Berlin’s season officially ended when it lost in the Pod C final to Ellington 6-4, but Van Etten is already ready for next year. With nearly the entire squad coming back and some other promising younger players set to join, 2019 could be Berlin’s year to make a run at a state championship. Posted in New Britain Herald, Berlin on Thursday, 26 July 2018 21:04. Updated: Thursday, 26 July 2018 21:06.